Before I describe the plot of this book, I want to say that it sounds really, really cheesy when summarized. Please bear with me. I’ll keep it short. 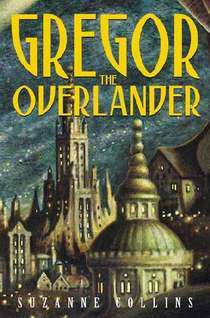 Gregor and his two-year-old sister, Boots (nickname), are doing laundry in their apartment complex’s basement when they investigate an air draft coming through a grate and end up falling hundreds of feet into the Underland. The Underland is an underground world filled with giant cockroaches, spiders, and rats, as well as humans who are so pale they’re translucent. Because of a prophecy written by the original explorer who brought humans to the Underland hundreds of years ago, the rats begin a war against the rest of the creatures, and Gregor finds himself leading a quest to try to save their world. Okay. Yeah. Yes, it sounds cheesy. When Morrigan picked this book for me to read for our family book club, I was not particularly happy. Giant rats and cockroaches? Underground society? Mm. Sounded too much like a sewer-version of Narnia to me, and I didn’t like Narnia to start with. The only thing this book had going for it was the author: Suzanne Collins, who wrote The Hunger Games, which I loved. She advocated peace whenever possible, fighting only in defense or to save those we love from harm. She talked about loyalty and trust. She touched on the longlasting grief caused in children who have lost parents, as well as the importance of family in general. She addressed understanding others in so many different ways. Gregor was constantly reevaluating the way he saw people (and creatures) based on learning more about them. People he judged badly at one point, he came to understand by the end of the book, even if he never particularly liked them. Beyond that, Gregor was the character who most tried to understand the non-humans, and pushed everyone else to cooperate and understand each other as well. He was almost a poster-boy against discrimination and prejudice. As well as understanding, there were lessons about forgiveness and mercy. Lastly, Collins pushed for hope. Hope for harmonious and cooperative living, hope for peace in the Underland, hope for the lives in the Overland (our world). I loved it. I can’t say it was without problems – there were a few parts that felt a little forced, as if she directed the plot just a little too heavily – but for the most part, it ran smoothly. It was easy to read in snatches in between writing my NaNo book. Not too difficult to put down, but very easy to pick back up, too. The ending is not a cliffhanger even though it’s the first book in a series – it could be read as a standalone book. That’s a big plus for me. I do recommend this book, especially if you like middle-grade fiction. I’ve read quite a bit of middle-grade fiction in the last year, and this has been one of my favorites. Plus, it just has so many good messages, so many good things I’d want my kids to learn, that I would have no trouble giving it to younger readers. I’m happy that Morrigan has read the whole series. I used to suspect they were violent books, but they aren’t. I won’t claim there is no violence at all, but none of it is gratuitous, and it is both tactfully handled by the author and regretted by most of the characters. This entry was posted in 2009, Children's, Prose and tagged speculative. Bookmark the permalink.